A friendly informal group for people in their late teens, twenties and thirties, led by young people for young people. We are supporting one another to deepen our experience of the Dharma, through friendship, events and study. No charge. No need to book, just turn up a few minutes before we start.. Tonight we’re looking at loneliness. Who is the Centre’s Young Buddhists Group for? 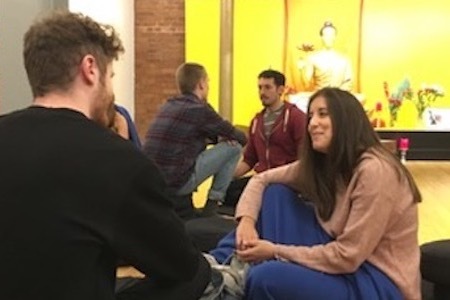 Anyone aged 18 to 35 who has learned the two meditation practices we teach here – mindfulness of breathing and Metta Bhavana – and is interested in practising Buddhism with other younger people. We usually meet on the third Friday evening of the month. Interested? Just come along to one of our meetings or get in touch with us through reception. The group is currently led by Sanghadhara, Siladevi and Dan Johnston. We also have a YoungBuddhistsMBC group on Facebook.